I'm finally home from a fun-filled two weeks and ready to blog about it! My baby sis, Krista got married on the 24th in a gorgeous wedding in Monterey. Here is the wedding invitation I put together on photoshop. The image is by her wedding photographer at Images by Ruby We found out that Costco wouldn't have the flowers that Krista wanted for the wedding when she went in to order them. So my sister in law and mom went around to all the grocery stores and nabbed as many lilies and roses as they could in white. Luckily Krista wasn't super particular. 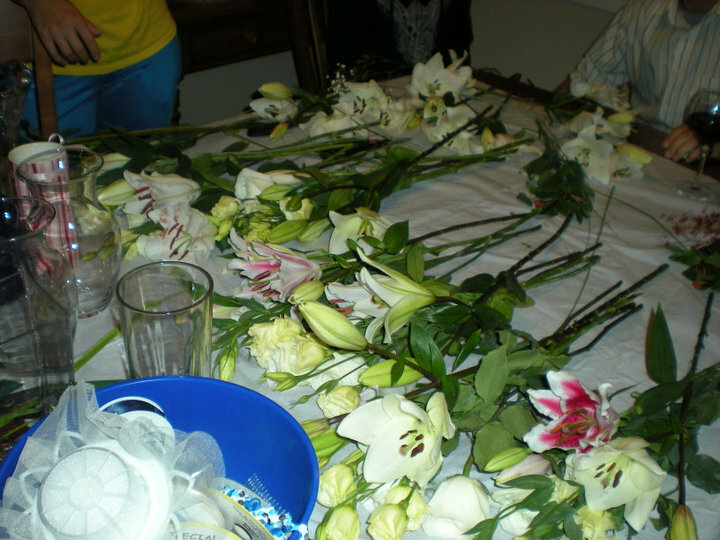 Here I am the night before putting together 9 bouquets. Yikes! Krista and I thought feathers in hers would look great with her dress. And we were right. It really did. I spent the morning of her wedding day making the boutonnieres and corsages. I didn't actually do that much for this sister's wedding. She had everything very much in hand. I did the flowers, bustled her dress, and made her birdcage veil and hairclip flower. That's it. Pretty easy peasy. 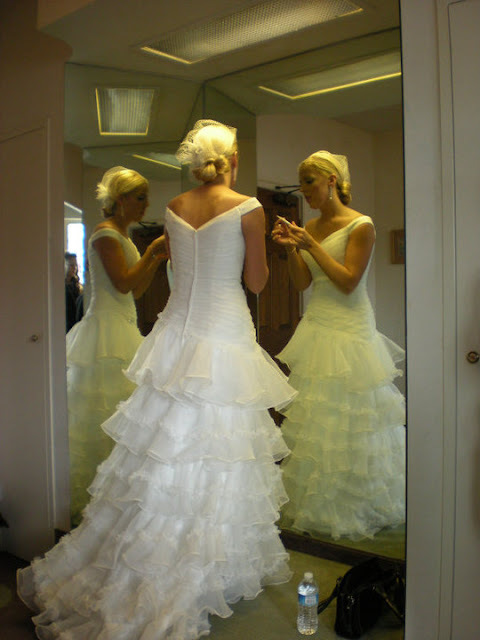 And because Krista is Krista and extremely classy, she did not have the typical strapless satin bridal gown. Just like Katie and I didn't either. We sorta rebel against the norm I guess. I loved her dress on her. Perfection. We also don't behave in wedding rehearsals like we are supposed to I guess. Here are Katie and I laughing our heads off about something. That's alright. My brother-in-law, Brad, and brother, Josh don't really behave either. I'm sure someone is talking here directing somebody. However it's more fun to be silly and strike a pose...for my husband with the camera who was egging them on. No one in this family knows how to be serious I guess. Hunter and Ainsley took their jobs very seriously at least. Ainsley didn't just drop the petals, she spiked them to the floor as hard as she could to make sure they got there I guess. Here is Krista getting ready. See? Classy and unique dress, right? And the feathers in the bouquet with it were perfect. The siblings and spouses did manage to be serious for one church photo at least. I thought the wedding colors in grey and blue were gorgeous. You know what my favorite part about the bridesmaid's dress was? I can wear it again and they have pockets! All I can say is...boys. Pretty girls. I am wearing my tallest heals and I still look short. Krista is wearing satin blue ballet flats in comparison. I'm a shrimp next to the other siblings in the family. All I can say is, Josh had a lot of fun with this particular pose. Hunter looked like a little stud. He adores his new Uncle Thomas. Isn't this picture too cute? One picture of the happy family before heading off to the reception. I didn't get one picture snapped at the reception. How terrible is that? I was too busy dancing, taking care of kids and having fun. We all kinda let lose on the dance floor. It was gorgeous in there too at a beautiful hall at the Naval Post Graduate School. Fun was had by all and the kids also had a blast dancing. The only bad thing was, they decided to let loose and go crazy during the toasts and created an embarrassing distraction until I could get them off the floor and sitting. Kids. But what can I say...judging from these photos, the apple doesn't fall far from the tree. Oops. What a beautiful wedding! Her dress was gorgeous!